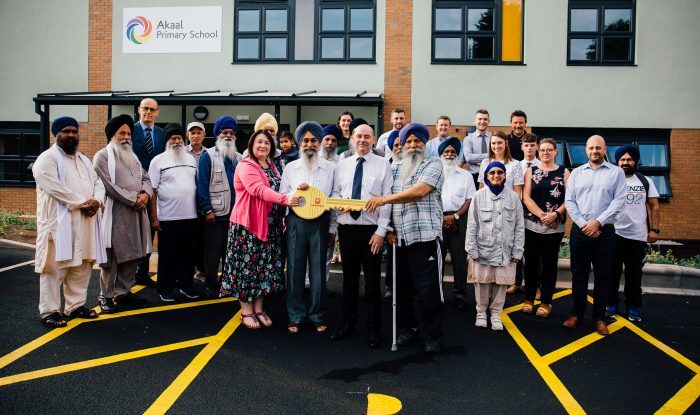 Midlands contractor G F Tomlinson has completed the construction of Akaal Primary School on Grange Avenue in Normanton, a brand new school with state-of-the-art facilities – from classrooms to bug hotels – for 420 pupils aged four to 11. Akaal Primary School, which will meet demands for improved educational standards and an ethical, value-based education in the Normanton and surrounding areas of Derby, will have a Sikh faith ethos. It includes 14 classrooms, a library area, kitchen classroom, main hall/dining area, Special Educational Needs provision, more than 7,000m2 of outdoor learning space and 2,200m2 of habitat areas. Whilst on site, G F Tomlinson worked with the school and Maber Architects to design and create a ‘Forest School’, which was formed from surplus materials from the building works. This complimentary addition – equipped with a fire pit, compost areas, two bug hotels and a poly tunnel – will complement the new school building and provide outdoor environmental and ecological learning. Derby’s first Sikh school, Akaal Primary School, opened in temporary accommodation in September 2015 and currently has pupils enrolled from Reception to Year Three. The brand new school, located nearby the temporary accommodation, will allow the school to almost quadruple its intake of students over the coming years. All 98 of the school’s current pupils plus teachers and support staff were welcomed to the site as the project reached key milestones to get a sneak peek of the building as it progressed. After the handover of the new school, Akaal pupils and staff were brought over to see their new school before breaking up for the summer. “We have watched as the team at G F Tomlinson has transformed the uncared for, overgrown land into a learning environment for us all to be proud of. The Akaal Academy Trust and all of the staff have been so impressed that their team understood the importance of the building as a place for learning, rather than just another building to be constructed. They have taken time to work with us to make this a remarkable place for our children. “We are very lucky to have some additional facilities, including an enchanting Forest School, which have been made possible due to the resources on site and the hard work of both the school and G F Tomlinson’s team.